This little snake was discovered napping under a board at the edge of my yard, The board had been warmed by sunshine, becoming a nice place to raise this small reptile's body temperature. 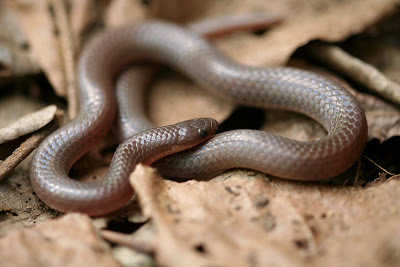 ...fortunately this little snake was napping under a small board I had put on top of the leaves in the woods. Wait until the sun has warmed it... then lift one side of the board quietly, slowly and already have your camera focused as closely as possible. While being careful not to spook the snake, rest your camera on your knee (or small tripod) and well..... good luck ;0) Sometimes they do run under the leaves but keeping very still and noiseless helps! Place the board back exactly as found and wait another day to try again.